Lykke Wallet is a next-generation trading platform with zero commission powered by one the trading innovators that were behind teh trading broker Oanda. Lykke want to make it simple to trade all asset classes using their app. This is done with immediate settlement and direct ownership are enabled by distributed ledger technology of Blockchain. Lykke today announced the release of the Lykke Wallet for Android. The wallet joins its iOS counterpart, released in June, as a key element of the Lykke trading ecosystem. Led by Richard Olsen, a co-founder of OANDA, one of the world’s most successful FX trading platforms, Lykke is a radically new approach to trading digital currencies and assets. Android users will find Lykke’s unique combination of a central price matching engine with cryptocurrencies held in the customer’s wallets. Unlike other well-known exchanges, if the Lykke exchange is hacked, clients can’t lose their money, because the exchange stores no customer assets. “We are grateful to the first Lykke Wallet iOS app users for their valuable feedback that helps us to improve the trading platform,” says Olsen. 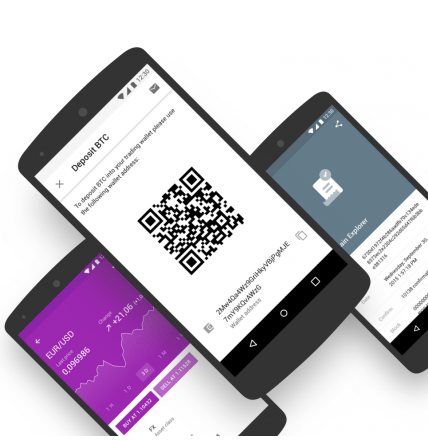 “Android users will find all the popular features we have introduced to the Lykke Wallet: real-time quotes, charts, ease of use, and of course settlement in minutes on the Bitcoin blockchain, all with no commission fees, ever.” Mobile users can even purchase dollars, euros, Swiss francs, pounds, and yen today, and store them using cryptographic keys the same way they store Bitcoins. Lykke was founded in Zurich by Richard Olsen and received initial seed funding in 2015. In May 2016, Lykke closed a second seed round. The company plans an ICO (Initial Coin Offering) in September. Lykke has an asset in Richard Olsen. Richard is a tech and trading pioneer in high frequency finance with extensive entrepreneurial experience and well known for his cutting edge academic work. He was co-founder of OANDA, a currency information company and market maker in foreign exchange. Under Richard’s stewardship as CEO of OANDA the company was a shooting star that launched the first fully automated FX trading platform offering second-by-second interest rate payments and netted 37 Mio of profits in 2007. Already at OANDA, he conceived the first trading platform with second-by-second interest payments. He is chief executive of Olsen Ltd, an investment manager, and visiting professor at the Centre for Computational Finance and Economic Agents at the University of Essex. His ambition is to transform financial markets into a seamless system without the inefficiencies that we today take for granted. Other key peopel are: Sergey Ivliev, Products and operations and Michael Nikulin an architect, designer and developer with 10 year experience in creating market solutions for financial institutions, including Anti-Money Laundering, Fraud Detection and Financial Markets Compliance solutions. Combines deep knowledge of financial architecture with Blockchain settlement mechanisms.